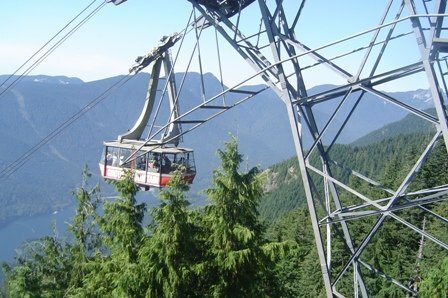 Grouse Mountain is located in North Vancouver which is across Burrard inlet and directly opposite Vancouver. A popular ski hill this mountain has the most prominent "ski lights" of the three local ski hills that are close to Vancouver. Another way to identify Grouse is that it is directly to the right of the Lions or at night it is the "middle lights" of the three local ski hills that have lights for night skiing. There are a number of things that people do at Grouse Mountain. One of them is skiing of course. Another is called the Grouse Grind which is a trail at the base of the mountain that works it's way all the way to the top. If you are very health conscious you might join other locals and use this very challenging trail as part of your fitness regimen. I have climbed up the mountain once in the past, I don't think it was the Grind, but it was quite the work out. One of the other things people do is take the Grouse Mountain Gondola up to the top of the mountain to ski in the winter or visit the facilities in the summer. Below are several pages of pictures that I took when I visited the mountain during the summer months. Although I think the $40 I paid to ride the gondola to the top is outrageous the views of Vancouver are second to none.